Performers include: Eoin Macken, Jill Flint, Ken Leung, Brendan Fehr, Daniella Alonso, Robert Bailey Jr., Jeananne Goossen. J.R. Lemon, and Freddy Rodriguez. This medical drama takes place at the underfunded San Antonio Memorial Hospital and follows the men and women who work the night shift — where the toughest and craziest cases always seem to come through the door. The staffmembers are an irreverent and special breed. Adrenaline junkie TC Callahan (Eoin Macken) served three grueling tours of duty in Afghanistan. An Army doctor who uses unorthodox methods to save lives, Callahan’s brash style does not always sit well with the bosses. He is however a brilliant surgeon and a fearless advocate for his patients. His best friend is Topher (Ken Leung), a quick-witted free spirit who knows how to manipulate the system in his favor. He will do whatever it takes to save a patient’s life. TC’s protégé is Drew (Brendan Fehr), a former Army medic turned doctor who knows how to let off steam with a casual prank. When lives are at stake however, he’s all business. He’s proud to be part of the often-ridiculed night shift and engages in mixed martial arts as a way to reduce stress that comes with the job. 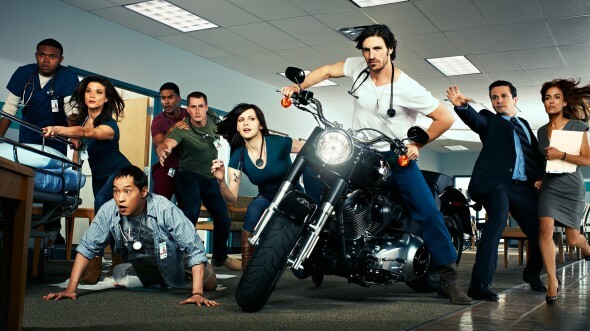 The new night shift boss is TC’s ex-girlfriend, Doctor Jordan Alexander (Jill Flint). A brilliant physician, she’s recently been promoted with a mandate to bring order to the emergency room. She struggles to keep everyone in check, but TC doesn’t make it easy. Paul Cummings (Robert Bailey Jr.) is fresh out of medical school and still adjusting to the rigors of an emergency room as a surgical resident. Krista (Jeananne Goossen) is also a new intern. She’s smart and beautiful and as comfortable with her sensuality as she is with a scalpel. Kenny (JR Lemon) is a seasoned nurse who keeps the doctors focused on the tasks at hand. He works hard to ensure that patients get the care they need, even if it means he has to break a few rules. Landry de la Cruz (Daniella Alonso) is a fun-loving Texan and the lone psychiatrist on the night shift. She finds she has to tend to her colleagues as much as she cares for the patients on the ward. Making their lives even tougher is the fact that the night shift is now under new senior management. Michael Ragosa (Freddy Rodriguez) is an unflinching bureaucrat determined to cut costs but he’s also hiding a health secret that has kept him from becoming a doctor. He often releases his frustrations on his staff, refusing to let anyone see him as weak and ineffectual. First aired: August 31, 2017. What do you think? Do you like The Night Shift TV series? Do you think it should have been cancelled or renewed for a fifth season? I love Night Shift I felt like they were family I want to know what happen to TC sister -in-law bring it back I have my family watching . I just found the series on Netflix and loved it! Hate how the series ended. Wish they would make a a season 5 at least on Netflix. We just found this series and really enjoyed it. Actors were awesome, acting like they were the friends their roles portrayed. I like to see family and friendship of a team within a story line. The drama was captivating. I so appreciated the limited profanity since this so often ruins what would be an enjoyable show or movie. Current events/issues were addressed in script that gave both sides of issues, leaving the audience to think on their own. Would LOVE to see this brought back!!! This was truly a great, great show. It is horrible that NBC would cancel a show like this. It was far better than Grey’s Anatomy. It was realistic and so many people enjoyed it compared to some of the other shows out there. Very sad, please bring it back because of consumer demand.